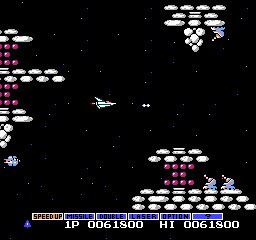 It's so hard to review a game like Gradius. This is a near-legendary title and has inspired a franchise that has sold millions, not to mention the spin-off series Parodius and countless other clones. But when reviewing classic retro titles, you have to judge if this game is still worth playing today. 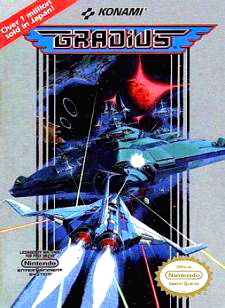 Thankfully, Gradius is a game that has aged much better than most shooters of the era, regardless of the fact that its many sequels have improved the core concept in practically every way you could possibly imagine. In terms of pure visuals alone, Gradius has a very bare aesthetic which betrays its roots as an early NES release. Taking place largely in space, the background is black for most of the game, and the tiny sprites do little alleviate the sense of dullness. In the game's favour, it does move at a decent pace and offers plenty of challenge. The depth and variety of the game's power-ups was an immediate draw for players back in the '80s and one of the reasons that Gradius was able to make such a splash in arcades. It goes to show just how unique and appealing the system is when you consider that it still holds up today. Modern updates to the series still use the same basic formula now, over two decades later, and also pay homage to another key feature first seen in Gradius – the core. "Shoot the core!" is the series' call to action, referencing the pulsating inner energy chamber that serves as the weak spot for the vast majority of Gradius boss characters. 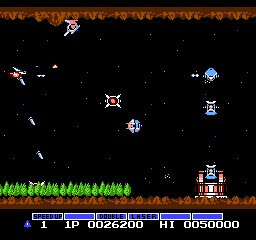 Visually it's not going to turn heads, but then the Gradius series has never really been about impressive graphics. The gameplay is the big draw here and it's refreshing to find that the central gameplay of the franchise hasn't really changed since this version was released. Oh, and the rather unhealthy fixation with Easter Island statues is both confusing and entertaining at the same time! While there are much better shooters around, Gradius is one of those games which is worth experiencing purely to see how far the genre has come. In many ways it was a groundbreaking release for its time, and much of what made it fun back in the '80s remains - just don't go expecting a game which is going to shock or stun you with its gameplay. 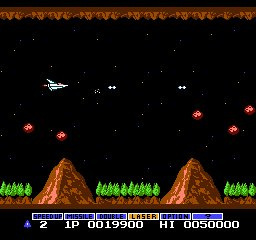 Unless you preffer one with more action...like gradius 2: Gofer No Yabou -, or the others on the TG-16. I have it in the Konami Arcade Classics in NDS and it is very addictive. "But when reviewing classic retro titles, you have to judge if this game is still worth playing today." Heavens no. This is the biggest problem with reviewing old games, because it's almost impossible to accurately make this judgement. Besides that... There's no mention of what the game offers by itself, no comparison to contemporary works, no comparison to the important original version (arcade), and an attempt of an even more ridiculous judgement (the sequels do it better) with these basics ignored. That whole bit about "the formula holds up two decades later" is completely meaningless, especially when my other complaints are taken into account. Just about the only thing this article does right is a good understanding of semantics (using apostrophes in year abbreviations correctly).